Team Sonic Racing: TGS/EGX RECAP! We had Team Sonic Racing appearing at both TGS and EGX this past weekend! Here are some facts we learned from the two conventions. Hello beautiful people, it's RidersDX and I'm coming at you with another round-up of Team Sonic Racing news! Check out the video version of this but I'm going to lay out everything I went over in the video right now! 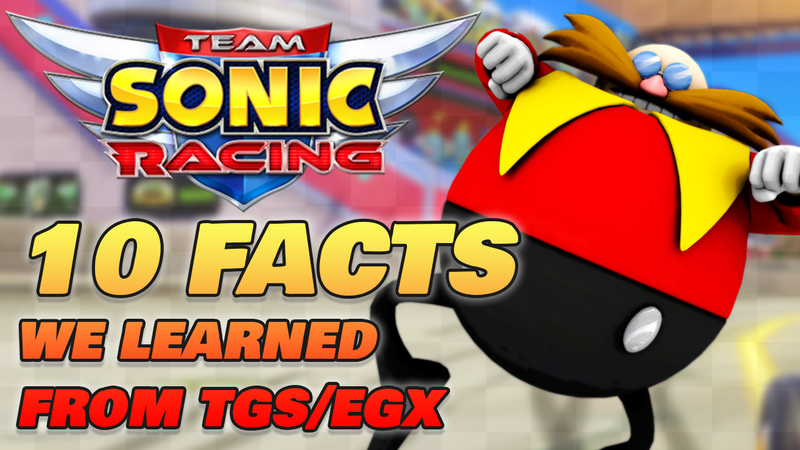 We had Team Sonic Racing present at both TGS and EGX this past weekend so there was bound to be some new information unveiled (except a release date...). 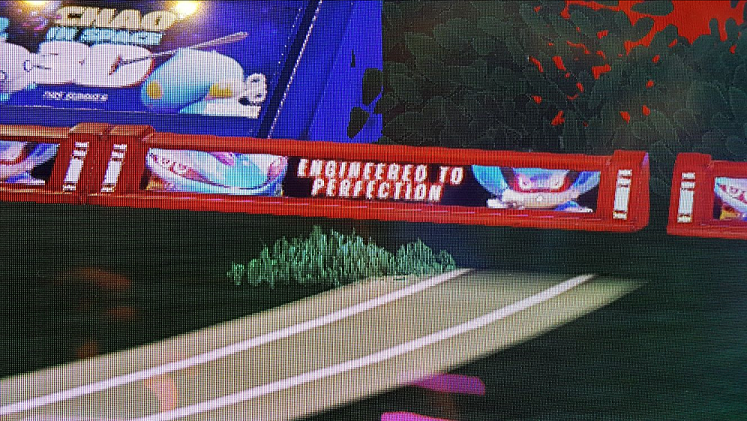 One: Dr. Eggman was revealed to be a playable racer! We got to see footage of him in action during the TGS stream where they showcased Market Street for the very first time. Check out Eggman's huge monster truck-like vehicle in the screenshot below. Two: We got ANOTHER character reveal this time although Dave from Sonic Stadium may have forced the hands of Sega on this one. Metal Sonic has been confirmed as a playable character in Team Sonic Racing. He can be seen on a billboard in the demo that's apparently been there since E3! So it's quite amusing that no one has caught on to this actually. Three: During the EGX panel with Sumo Digital, it was revealed that only 12 of the characters have been revealed so far (not counting Eggman or Metal Sonic). So this means the Egg Pawn does not count towards the character roster, and we should have one more character left to be revealed for the game! 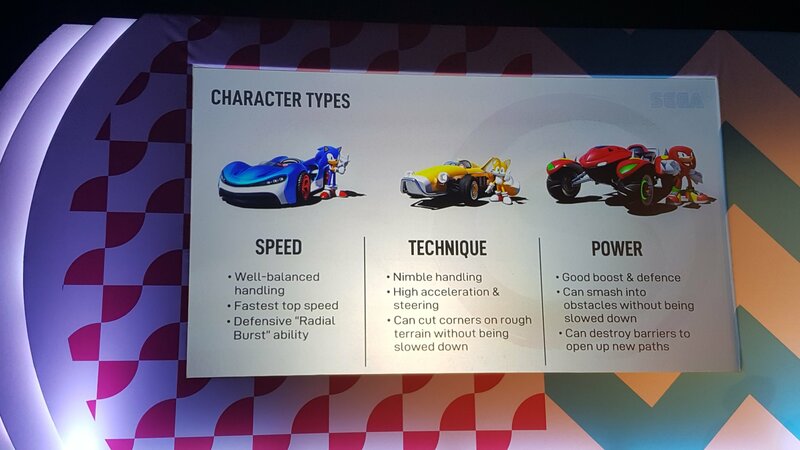 Four: We FINALLY got direct information on the differences between the types of characters in Team Sonic Racing. Check out this slide set that was shown during the EGX panel. Five: During the TGS stream, while playing Market Street, Silver's team activated their Team Ultimate. During the power-up, Silver's theme "Dreams of an Absolution" can be heard! Though it is in a remixed form, so it is possible all the characters have a theme song associated with the Team Ultimate that is remixed. Six: During the EGX panel, Sumo Digital that the 21 tracks in the game with be a mix of both remastered and NEW tracks! So we should be getting some original locations in the game. Seven: The ice track was designed to take elements from various ice stages in Sonic's history, rather than one stage in particular. Eight: In the TGS stream, Vector can be seen utilizing the lazer wisp on the track, which as far as I know, has not been seen to this date in footage. Vector seemed to be dragged farther along the race track in a zig-zag fashion. Not much else could be deciphered from the footage. Nine: During the TGS stream, a remix of "Can You Feel The Sunshine" can be heard playing at the end, which is a nod to Sonic R, one of Sonic's first ventures into the racing genre. Ten: You'll have the ability to play four player split screen in the online mode! So you can take friends with you to race others online. Did you find anything I didn't cover in this article? Let me know in the comments section below!